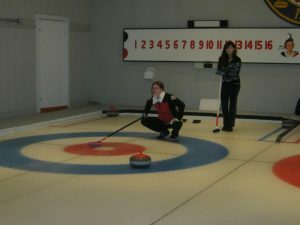 North Hatley Curling Club has leagues for different age groups and skill levels. See the list below for more information, and download your membership form. Social members and non-curlers are also welcome. Come and join us, and glide through winter! Sign up in advance at the club, except for Friday afternoon seniors which is drop-in. A friendly and informal mixed adult league; all skill levels. Just-for-fun adult, mixed doubles league; all levels and ages welcome. Informal adult league in conjunction with Lennoxville Curling Club. Semi-competitive inter-club adult league comprising six teams from the region. Just-for-fun league; all levels and ages welcome. A friendly and very informal drop-in league; teams made up from whoever shows up on the day; all levels welcome. A semi-competitive adult league, which includes teams from other clubs.